Improvisation is a mode of the creative process that relies on the instinct and intuition of the performer. Usually, in music, it is encountered within a structured composition framework. Take any of the jazz greats and the unique spin they impart upon beloved standards; in forcing themselves to generate musical ideas on the spot, they inherently shift their focus towards the ephemeral and tangential possibilities that lie beyond the confines of more deliberate methods of composition. What happens, then, when one chooses to improvise the foundation structures of these pieces? This is something that Jared Marshall, under the moniker Primary Mystical Experience, ponders. With a modular synthesizer, a keyboard, a microphone, a drum kit, and a blank canvas, he invites his listeners to enter this “meditation” with him. Instead of exploring premeditated fragments of ideas, he simply lets the instruments speak for themselves first; and he follows after them. His goal is to “get myself out of the way as much as possible, and let what I am hearing happen in real time, " Jared remarked. The synthesizer has a profound influence or the inception of each exploration. As there is no real keyboard, he is at the whim of the patch bay- often as surprised at what emergent soundscapes undulate forth from the monitors as the audience is. Once these morph into motifs, or ostinato currents, Jared springs forward, never letting himself be constricted by key or meter. This is challenging music. In order to get the most out of it, I, just liked Jared, had to strip myself of all expectations. As soon as I was able to let my guard down, close my eyes, and take deep breaths, I really entered the music. It asked a lot of me, and I gave it all I had. I was rewarded with an experience that, warts and all, had me feeling more connected to the artist before me than most performances in recent memory. The first set began with the sound of a rainforest in spring- lush layers of foliage filtered the melodious songs of countless birds, creating an environment that was at once warm and inviting. Jared, by design or by chance, was making it easy to enter his world. From there, the process, lain out so transparently for the audience through visual cues and expressions, became easy to understand. It was easy to recognize when we were traveling towards a dead end, or when we were entering a new, fertile territory for exploration. The beat began to intensify, and then- cold. We had taken flight from our first setting and began to travel for the moon. Icy, piercing CS-80 patches evoked an aura not unlike that of Blade Runner. From our conversation, I knew Jared to be a fan of the synth artists who helped define the world of synth music at its inception, including artists like Klaus Schulze, Morton Subotnik, and others. It is miraculous how articulate Jared is in borrowing from his idols when creating his own worlds to explore. The set ended on what felt like a question, before fading into silence. After a welcome chance to regather and refocus, the second set began. From the first moment, I knew this half of the performance would be remarkably different in structure and tone. 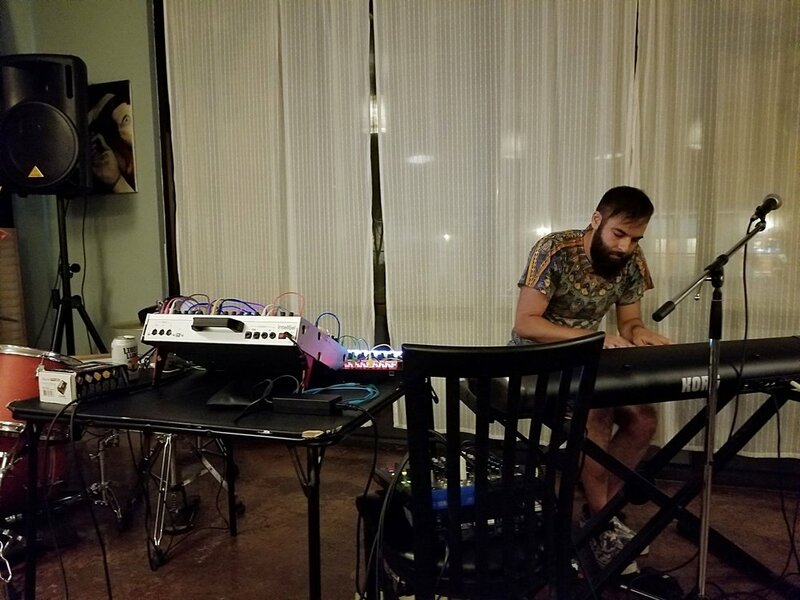 A heavier reliance on loops, Rhodes keys, and drums revealed Jared’s hip hop and jazz leanings more so than his first set. It was less otherworldly, perhaps, but still contemplative. He rapidly decontextualized each looped beat, adhering it to a new drum foundation every thirty seconds or so, with great ease. Here he was, working with a more limited palette, and yet still delving into unexpected territories! “That was that loop. Now, one more!” Jared said. Each of the three loops that he explored just added to the diversity of the set, and my impression of him as a versatile artist. This was a complete 180-degree shift from the expansive first half of the show. It felt tight, focused, and more D’Angelo than Vangelis. We embarked on one more journey into the realm of folkloric mysticism. Now that we understood him, was Jared bringing us to our most vulnerable moment yet? He calmly took to the microphone, guiding us through an impenetrable sea of fog. Dark, dense, but never chaotic, this part of the set was perhaps the most emotionally intense, and the most confrontational. After ramping up the wall of textures and scintillating arpeggiators, we were brought back down to stable ground, and from there, Jared ushered us back into the real world, reborn. Getting to be a part of such an involved and inviting experience is a privilege. Yes, this nearly two-hour set was demanding and intense, but every moment was justified. Each time a musical path hit a dead end, every time we had to set off in a different direction, we were still learning and exploring, guided by an ever curious maestro. Jared’s child-like wonder and curiosity as an artist is refreshing, invigorating, and certainly regenerative. If you get the chance to see Primary Mystical Experience live, make sure that you do; there’s no telling where you will go, or how you will get there.